Fighter jets of the Nigerian Air Force conducted air strikes on at least three Benue State communities on Saturday, in an operation which lasted several hours. 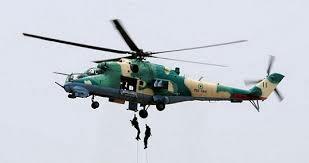 The NAF Director of Public Relations and Information, Air Vice Marshal Olatokunbo Adesanya, confirmed the air strikes to our correspondent. He noted that it was an ongoing operation and that he could not reveal further details. Our correspondent learnt that the air strikes were carried out along the Katsina-Ala to Zaki Biam and Wukari Road and that the affected villages included Gbise, Ayaka and environs. A reliable source in Katsina-Ala, who is privy to the air attacks, said the operation could be a reprisal on hoodlums in the communities. Some hoodlums, dressed in military camouflage, had last week attacked the Commander of the Nigerian Army Engineering Corps, Maj Gen John Malu, in his hometown in Tse Adoor, Tiir Ward, Tongov in the Katsina-Ala LGA of Benue State. The source said, “Gbise, Ayaka and other nearby villages in Katsina-Ala were on Saturday bombarded by the air force. These are reprisal attacks by the military to clear the hoodlums who attacked Maj Gen Malu when he was home last week. Our correspondent could not ascertain the number of casualties or dead as of press time because military sources said the operations could last till Sunday (today).